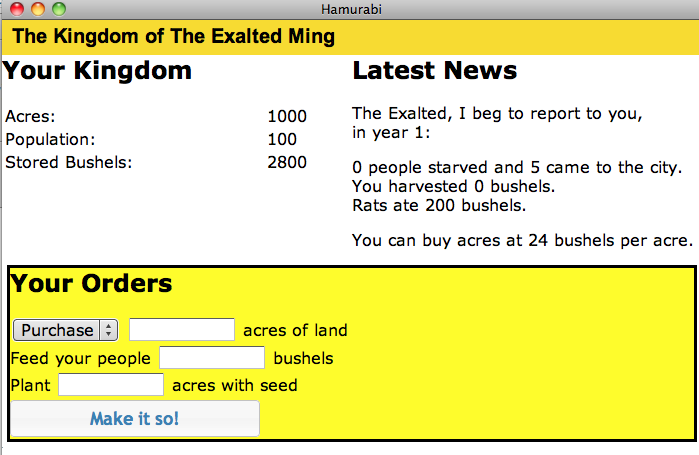 Today I’m happy to release a little project I’ve been working on for the past few weeks - a port of the old basic game of Hamurabi. This is a game I used to play on my Apple II a long, long, long time ago. The premis of the game is simple. Given a kingdom with acres of land, bushels of grain, and a population, you decide how much land to buy or sell, how much food to give your people, and how much should be planted. Of course, what those figures mean for your kingdom is notoriously hard to figure out. The game is hard (although I made it a tiny bit easier) and intentionally vague. You will fail. I failed pretty badly too into I completely ported over the old BASIC code and saw the exact numbers used. To make things a bit more interesting, I added a small social aspect to the game. As you play, you will see notices from other players as they play. This makes use of a demo by Mike Fleming (Adobe AIR Notification Demo). I modified his code to make his notifications dynamic. The idea was that as you played, you would see how others did and either be encouraged to beat them, or use it as an opportunity to trash talk. And yes - this makes use of the amazing BlazeDS talking to a simple ColdFusion Event Gateway. Another change I made was to prompt you for a title and a name - this leads right into the messaging aspect so the notifications are more personal. Working with BlazeDS and HTMl/AIR apps is - for the most part, simple. I've already talked about Stephen Moretti's excellent blog entries on it. I strongly recommend taking a look at that. The biggest issue I ran into was getting my application to send messages. I spent an hour because I simply didn't have a fault handler for my producer. Dumb. Never, ever, ever skip using a fault handler. The second I did that and saw that I wasn't specifying a destination for my messages, it didn't take long to fix. Yeah, may be obvious I guess - but it was a painful lesson. Man - I never really appreciated the simplicity of Flex's States feature until I needed in HTML. Handling the various states of my application was tricky. I made use of the Dialog control from jQuery UI, but all in all, I'm not terribly pleased with my solution. I really think there should be a more elegant way of handling this. jQuery demos are easy. Applications are non-trivial. Handling sending a message to everyone and ignoring it yourself. Anyway, take a spin with the application and use the Download link if you want to see the complete source behind the application. Diagnosing an error - Form entries are incomplete or invalid.